"It's a statement that's very easy to make, but much more difficult to prove." At the opening news conference for the Convention on International Trade in Endangered Species (CITES) meeting, Willem Wijnstekers gave more answers on ivory than anything else - in particular, on the question of whether even a very limited legal ivory trade would stimulate elephant poaching. Some animal welfare groups believe there is a link. "Whenever CITES even talks about ivory sales, poaching goes up," Peter Pueschel of the International Fund for Animal Welfare (Ifaw) had said at a pre-meeting briefing. The argument is that poachers will spot an opportunity to introduce illegal ivory into the market if a network for legal trade is operating. Others, including CITES secretary-general Mr Wijnstekers, are not so sure. "The data we have from Etis [the Elephant Trade Information System] is that there is no correlation between decisions made at CITES and the illegal trade," he said. Two things had sparked this debate. Just before the meeting opened, a CITES technical committee had decided that a one-off sale of stockpiled ivory from Botswana, Namibia and South Africa, approved in principle in 2002, could go ahead. And the same three countries plus Zimbabwe are asking for annual ivory export quotas, opposed by another African bloc under the informal leadership of Kenya and Mali. Getting some firm answers would seem to be a key requirement for the conservation community. 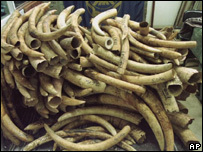 Etis is a database of all seizures of illegal ivory made by customs officers, police or anyone else in authority globally. It documents where, when, how much, who, and as much information as possible about the route involved, including countries of origin, transit and destination. CITES formally established Etis under the management of Traffic, the wildlife monitoring network run by the World Conservation Union (IUCN) and WWF, in 1997, eight years after Traffic began gathering data independently. "We have something like 12,378 seizure records in the database now," says Tom Milliken, the organisation's director for eastern and southern Africa. Seizures can only give an indication of the amount of poaching, because authorities vary widely in their competence and inclination to intercept valuable shipments. Nevertheless, he maintains: "It captures the general trend, and if we see that the trend is going down for example, it really is going down." A graph shows no apparent relationship between CITES meetings where ivory sales have regularly been discussed, and seizures. Even the only previous one-off sale, approved in 1997 and enacted in the years following, made no visible bump on the graph. "After the one-off sale, we had six years of a decreasing trend," says Mr Milliken, "so the data does not support the hypothesis." But maybe Etis is the wrong database. Ideally, perhaps, you would use records of poaching, not of seizures. That was the case which the Kenyan government made to CITES in 2002. "There have been numerous reports by wildlife officials suggesting a rise in elephant poaching since CoP10 (the CITES meeting where the one-off sale was approved)," its submission read. "Though many of these are of necessity anecdotal, they are nonetheless of concern not only because of the numbers involved, but because they indicate apparent resurgence of poaching in areas that had been relatively quiet." It is an argument that the Kenyan authorities stand by today. "Any legal trade is an incentive to the illegal trade," says Patrick Omondi, head of species conservation and management at Kenya Wildlife Service (KWS). "That's why we are pushing for a 20-year total moratorium on any legal sales." The problem for Kenya's case lies in that word "anecdotal", which is to scientists what a rabbit is to a hungry dog. Anecdotal evidence presents no problems for NGOs such as Ifaw whose positions are based largely on ethical conviction. It is a problem for CITES itself, and for organisations such WWF and Traffic, which all recognise that animal trade can bring money to needy communities, even generate funds for conservation, and demand hard evidence that trade is doing damage before they will back a ban. In an attempt to get some firm numbers, CITES has set up another monitoring system called Mike - Monitoring the Illegal Killing of Elephants - which does exactly what its name suggests. It is gathering data from more than 70 sources in Africa and Asia, and aims to provide a comprehensive picture of how many elephants are being poached, and where and when. "There wasn't really any hard data before the year 2000, and that's why Mike was set up," says Mike's data analyst Julian Blanc. "We're really concentrating on getting baseline data, and there haven't been any sales since Mike began. 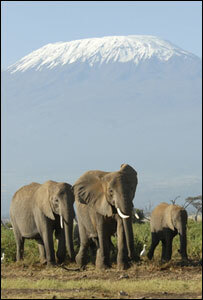 We're pretty confident that we will be able to pick up any upsurges in poaching." But it will take Mike six years to build up an accurate picture. In the meantime, CITES has some decisions to make. Ifaw urges a precautionary approach. "They (Etis) don't believe poaching is caused by the legal trade - we say it is," says the organisation's international advisor for Africa, Michael Wamithi, a former KWS officer. "In 1997, we did not change our law enforcement procedures at all, so there could be no other reason for the upsurge we saw in poaching other than poachers were anticipating that the legal trade would be permitted." One of the ironies, Tom Milliken points out, is that many of the countries backing the 20-year moratorium bid have an appalling record on making illegal ivory seizures. "Mali, for example, has reported one seizure in 18 years, but has been implicated in a further 42 [incidents of illegal trading]," he says. And the welfare groups, he says, may not be helping. "I think a lot of people act as they do because it's a vehicle for fundraising," he says, "and if you can stimulate a sense of urgency, you'll get people motivated and donating money. "Some groups with lots of money have not contributed anything to closing down unregulated markets in Africa." It is an argument which is likely to run through the second week of this CITES conference, as southern African states with abundant elephant populations, generally good records on poaching and a small but well-regulated usage of elephant products, seek further liberalisation, while others seek to shut the whole trade down.